Home » Buildings & Plants » Owners and managers » Existing buildings » Use Portfolio Manager » How Portfolio Manager calculates metrics » What is energy use intensity (EUI)? When you benchmark your building in Portfolio Manager, one of the key metrics you’ll see is energy use intensity, or EUI. Essentially, the EUI expresses a building’s energy use as a function of its size or other characteristics. For most property types in Portfolio Manager, the EUI is expressed as energy per square foot per year. It’s calculated by dividing the total energy consumed by the building in one year (measured in kBtu or GJ) by the total gross floor area of the building. 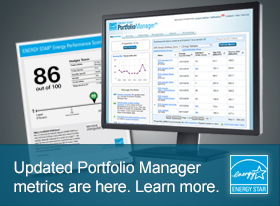 Portfolio Manager automatically does the conversion to kBtu or GJ, so you can just enter your energy use information as you get it on your utility bills. Both site and source EUI are available in Portfolio Manager, though EPA relies on source EUI as the basis for the ENERGY STAR score. Learn the difference between source and site energy. Generally, a low EUI signifies good energy performance. However, certain property types will always use more energy than others. For example, an elementary school uses relatively little energy compared to a hospital. So is 7,500,000 kBtu a lot or a little in a year? Well, it depends in part on how big the building is, right? For example, if a 50,000-square-foot school consumed that amount of energy last year, its EUI would be 150. But if a 10,000-square-foot restaurant consumed the same amount, its EUI would be 750. So in this example, even though they’re consuming the same amount of energy, the restaurant is far more energy-intensive than the school.